After finishing 15th at last year's Warrior Dash World Championship, I was looking to improve on this placing. If I'm being honest, I really wanted to finish in the top 5 and had even dreamt of winning. However, four of the top five guys from last year were returning so I would have to do my best to try and keep pace. My dad and I drove down to Tennessee Thursday before the race and got to take a walk-through of the course Friday afternoon. 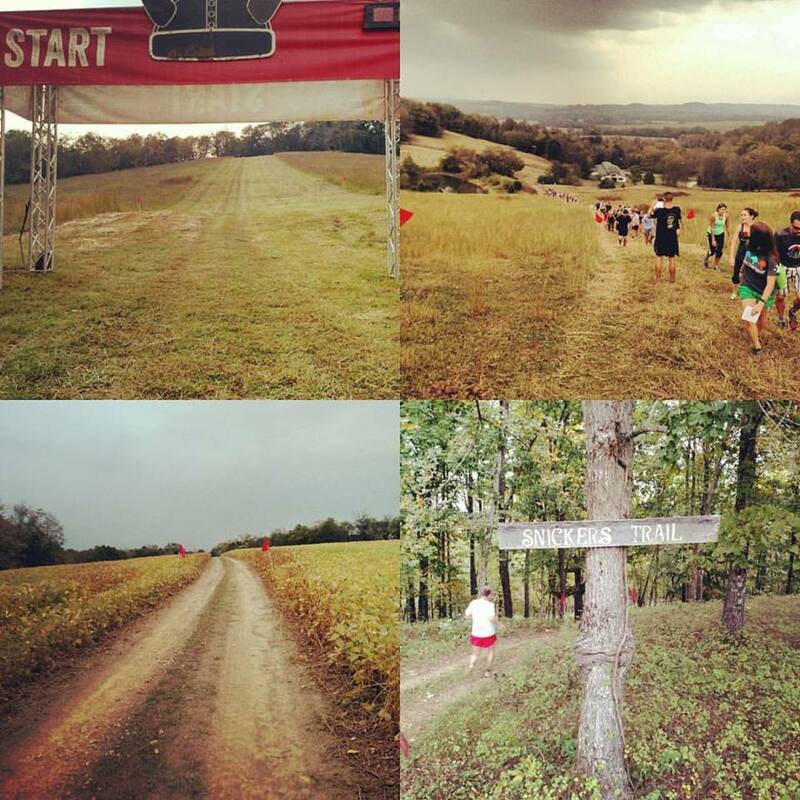 The race was held on the grounds of the Milky Way Farm in Pulaski, TN. Not quite the mountains of Northern California like last year, but still much hillier than Michigan. It's almost comical to compare this year's world championship race with this year's Michigan race (be sure to click 'Show elevation chart'). As you can see, the elevation change in the world championship race is a little greater than the Michigan race. I like to tell people that it's hard to train on any type of hills in mid-Michigan because the biggest 'hills' we have are highway overpasses! As you can see from the picture, the start was straight uphill. The rest of the course wasn't much flatter either. I made sure to show up to the start line plenty early to take a spot near the front. The start was pretty narrow so if you weren't in the top 20 or so, you would be behind from the get-go. 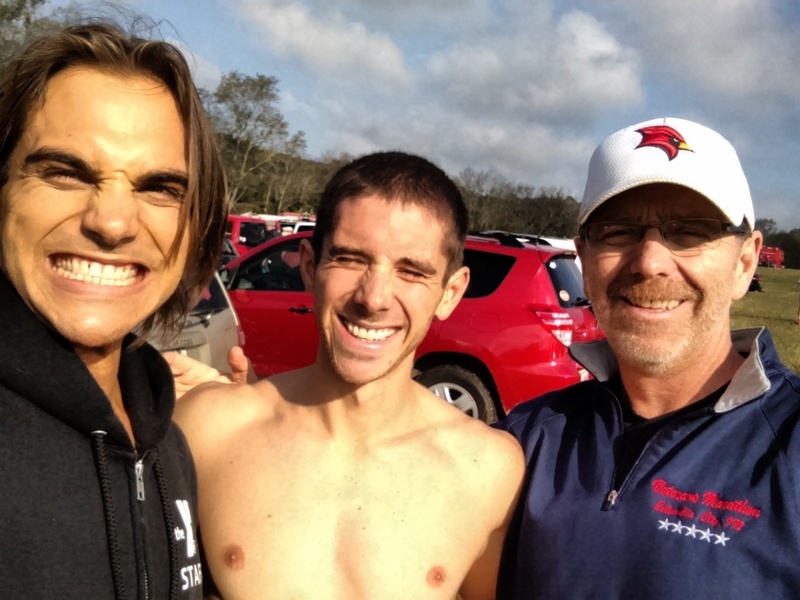 The top guys I was gunning for included Max King (who's accomplishments are too long to list, but I'll just throw this out there- he won the 2014 100k World Championship averaging 6:14/mile pace the ENTIRE RACE! That's 62.1 miles...freak doesn't even begin to describe him), Hobie Call (an obstacle course racing legend), Robert Killian (recently crowned Spartan Race World Champion just last weekend), and many others. I took my place right behind those guys at the start of the race, as you can see in the picture below. Since dad and I were able to go on the walk-through the night before the race, I knew I wanted to be conservative for the first half; it was extremely hilly and didn't play to my strengths at all. I just wanted to keep the leaders in sight so I could make my move in the back half of the race. Before I knew it, the countdown was on. And we were off! I let many of my competitors take off ahead of me and did my best to stay within myself on the initial hill. I did a pretty good job because as I was about half-way up, I was already starting to catch those that went out too quick. The first mile was purely running, no obstacles. Normally this would be awesome for me! After all, I did have the fastest run split in the nation for the USA Triathlon Olympic-Distance Age-Group National Championship. Unfortunately, this running was a little different: steep hills while running on grass and rocks. Not quite the smooth roads that I'm used to during a triathlon. I was being passed by a bunch of guys on the downhills and then I would re-take them on the uphills. I was really just trying not to get myself killed these slopes were so steep! The first obstacle came right at the 1 mile mark, Diesel Dome. This one looks kind of like a piece of playground equipment. Fun right?! Not so much...I climbed to the top, walked across the planks, and began my descent on the other side. To do so, I turned around and started down backward. While I was doing that, other guys were basically running down the rungs of the 'ladder' and further distancing themselves from me. Immediately following Diesel Dome were a set of Mud Mounds. This obstacle was my nemesis on the day. The video below doesn't do the mounds at the championship race justice. They were at least 15 feet high, but this gives you the idea of what we had to deal with. Just imagine them except twice as tall. I had SO much trouble getting up these stupid mounds. Every time I tried to scale the wall, I would just slide right back down; it was just a feeling of helplessness. It was almost like I wasn't tall enough to reach a good foot hold. I was doing my best to clamber up these mounds, but they were scattered throughout the course and I lost a LOT of time to the leaders on this obstacle alone. After finally coming out of the mud, it was back to running. The thick mud and red clay that we had to run over/through put a layer of this slick stuff on the bottom of my shoes though. It felt like my feet were bricks. I tried my best to kick the excess off before settling in again. It was another half mile before the next obstacle which, honestly, I can't even remember what it was. They all kind of blur together when you're running at break-neck speeds trying not to get yourself killed on one of the downhills. Speaking of, I had a slippery situation where I almost DID break my neck on one of these downhills. It rained heavily the night before the race which made certain parts of the course extra slick. I was descending one of the many hills and caught a wet patch of mud and almost wiped out. Luckily I did my best Kerri Strug and stuck the landing. Finally past the half-way mark (and all those stinking hills) and time to make my move! At this point I really had no idea what place I was in, I just knew that I had some catching up to do. So I put my head down and got to work. Luckily this part of the course was flat(er) and fast. I caught a couple guys, but not as many as I'd hoped. I guess when you're racing a world championship race, everybody else is pretty fast too! Who'd have thought? haha. Just before the 3 mile mark, I had a chance to see the guys ahead of me who were doubling back toward the finish. I kept pushing hard and caught one guy by galloping on the downhill (something dad and I practiced the day before. It helped keep me in control while still being able to go fast). Finally the finish line was in sight, but at this point I was still well out of my goal of the top 5. Coming to the last couple obstacles, more Mud Mounds and Muddy Mayhem (basically a crawl through the THICK mud under barbed wire), I jumped from the last mud mound and into the mud pit. Wouldn't you know it, but my shoes got stuck AGAIN! This is the second year in a row at the world championship that my shoes got stuck in the mud. Last year I spent about a minute yanking them out with my hands, but this time I said, "Screw it!" and left them behind. Unfortunately while I was trying to clamber out of my shoes and the pit, a few more guys passed me. It turns out that one of the guys who passed me today was the same guy who passed me last year when this happened! Ugh...maybe I need to rethink my choice of shoes. Triathlon racing flats may not be the best choice for mud runs! I crossed the finish line somewhere around the 30 minute mark, but because I lost my shoes (and my timing chip) all I know for sure is my finish place. I also must have bumped the 'Stop' button on my watch just after the 3 mile mark during because my total distance was only 3.23 miles so I don't have my backup timing device either. Garmin Connect Link to the walk-through the day before. I need to thank several people, but at the top of the list are my dad and my brother. First my dad for doing literally everything for me this weekend: being my driver, my crewman, my calming voice, and my support. I couldn't do any of this crazy stuff without you dad! 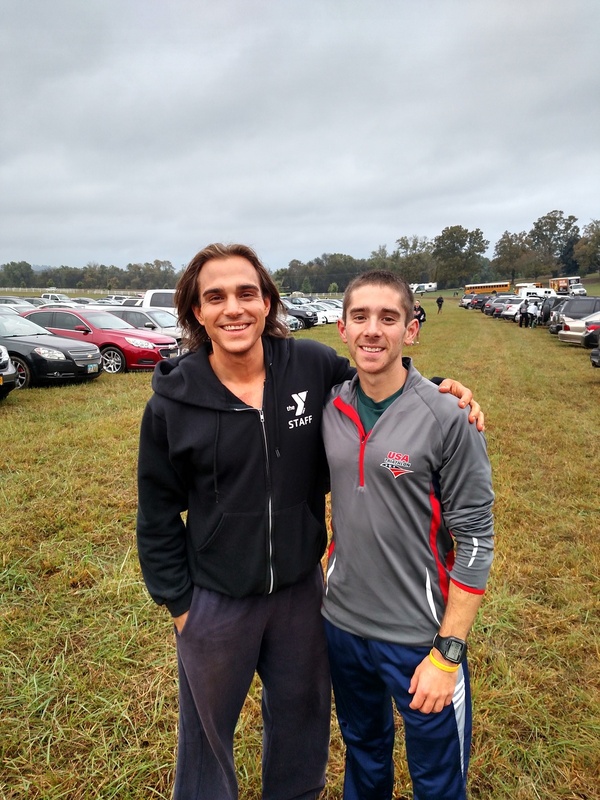 Next my brother who, after being on set and awake for almost 24 hours, made the 4-5 hour drive from Atlanta to watch me play around in the mud for 30 minutes. Having you there was a huge emotional boost and made me want to bring home a top finish for you Tyler. After the race we went to Shoney's for a 'little' post-race meal. Now normally I'm not very hungry after a race, even a marathon. It was a little different after this race though. We all ordered the breakfast buffet and I definitely made the most of that! I think I went up and got 3 or 4 different plates of food AND this delicious apple crisp. It even came with two spoons for me to eat twice as fast :D Okay kidding, I shared. Next I need to thank my mom who, even though she couldn't be there in person, was definitely there in spirit. As I was approaching the finish, I heard someone whistle just like you do mom :) it totally gave me goosebumps and made me push it all the way through the finish line. An absolutely ENORMOUS thank you to James Fry for the constant encouragement in the weeks leading up to the race. Even though I didn't believe in myself at times, you had unwavering faith that I would do well. An additional thanks goes to James for setting up this great platform for me to share my stories with everyone. I seriously don't deserve a friend as good as you James! Another special thanks to Coach Barb for preparing me as best as possible for this race. It's not easy to simulate the conditions I was racing in, but she gave me some gut-busting workouts that definitely helped get me as race-ready as could be. Finally thanks to everyone who wished me luck, prayed for me, or just sent me fast thoughts leading up to the race and for all the kind words after the race. I only wish that I could have done better for all you. I am ALWAYS my own toughest critic, but it's because I have all of you who I don't want to let down. Thanks for following along and now it's time for a break! My next real race will be the Boston Marathon in April where I will have the opportunity to race against more of the best in the world. Please enjoy my little post-race photo shoot (photo cred to my brother) of my world championship swag and some battle wounds I accrued during the race! I write this two days after the race and here is my current situation- sore! My legs hurt worse than they do following a marathon (I'm attributing this to the downhills on the course which cause a lot of muscle damage.) I find myself walking across campus and suddenly my legs will buckle and I have to catch myself so I don't fall. Additionally, going down a flight of stairs is my biggest nightmare. I feel ready to collapse like a bunch of broccoli! Warrior Dash World Championship offers $30,000 for first place. On a course that's just under 4 miles and caters more towards fast feet than upper body strength the normal 'kings of OCR' were quite literally given 'a run for their money'.